Adoptee Restoration: Mark Your Calendars and Come Join Me! Mark Your Calendars and Come Join Me! I've never attended an inner healing conference. In fact, when God impressed on my heart to lead one, I'd never even heard of such a thing. Shortly after I had the thought during prayer many months ago that I was supposed to do this, people started asking me to. 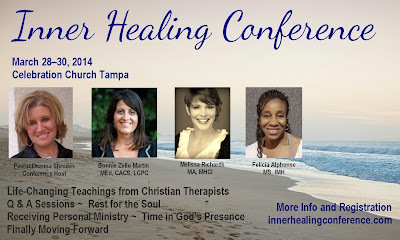 No, they didn't say, "Deanna, we want you to host an inner healing conference..." but what they did say was worded in such a way that it was basically what they were asking for. "Deanna, I wish you could get everybody together for a weekend conference that is focused on moving forward from hurts that we face..."
"Deanna, have you thought about planning a retreat where adoptees could focus on healing? I would like that very much..."
I've heard that repeated over and over and over again the past year -- rephrased in different ways. And it's just confirmed to me what I was sensing during my times of prayer. I'm a straight-up kind of gal, so I do need to let you know, this is a faith-based conference featuring Christian therapists and a Pentecostal preacher. I don't want any of you making the trip to Tampa and saying, "Hold on...I had no idea these therapists were going to bring up God. I had no idea they were going to actually pray, or that Deanna was going to run the aisles and wave a hanky and shout the house down..."
No surprises. I know, I know...you hate them. So I'm just preparing you... God is going to be there. God, the big kahuna, will be front and center. So, now that I let you know that He will be there...let me tell you who else will be there. 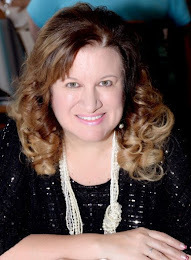 Two of the therapists that you've come to know here on the blog -- Bonnie Zello Martin, and my therapist, Melissa Richards, will be teaching sessions. We also have another therapist who will be sharing -- you haven't met her yet but you're going to love her! Her name is Felicia Alphonse, and she is a part of our Celebration Church family. These three incredible women are not only going to teach sessions, they are going to do a Q & A, and be available up close and personal, to minister to the attendees at the conference. 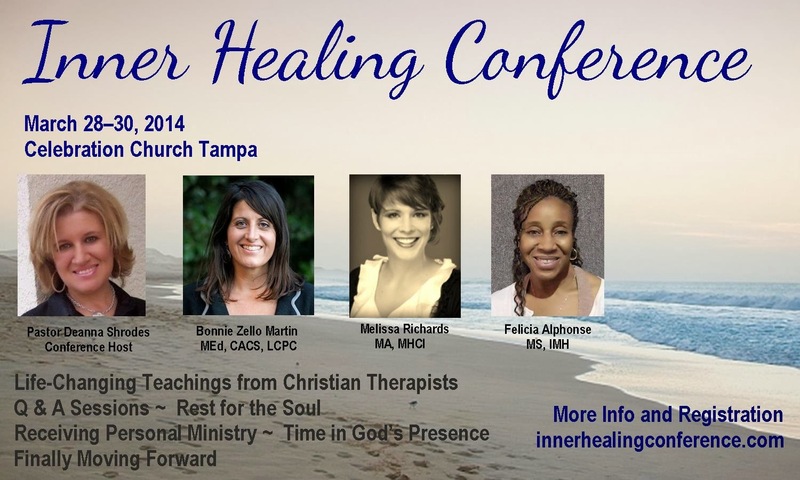 The inner healing conference isn't just for adoptees -- it's for ANYONE in need of healing. I think that's pretty much everybody on the planet. But this will especially be relevant to adoptees and as a matter of fact, I'm going to host a pre-conference bonus session (included in registration) exclusively for adoptees! This conference is priced so incredibly low, you're going to think it's a typo! I swear you're going to think I've lost my mind when you see the price. I set it that way on purpose because I've only heard a zillion times over the course of 26 years as a pastor, "I can't go to counseling. I can't afford it." I want everyone to receive help. No, you will not receive private counseling sessions. BUT...what you're going to glean from these three incredible women and from the presence of God at this conference will help you to move forward. I believe that with all my heart. When your friends and family ask you what you want for Christmas, let them know you need to get to Tampa Bay in March. Drive here, take a train, take a plane, ride your bicycle. Just get here. Once you've made the decision to be here, I want you to prepare to feel as if you've been dipped in a pool of peace. I can't wait to see you and give you a hug, in-person at the inner healing conference. So, without further adieu, please go to www.innerhealingconference.com and get all the info on how to be a part of it! Adoption: It's in the Bible!